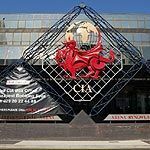 The Cardiff International Arena is a multi functional venue that has played host to some of the biggest music and comdey acts in the country. Do you work at Cardiff International Arena? What did you think of Cardiff International Arena? Went to see the Arctic Monkeys here last year was an off key gig and the venue was well placed for hitting the pubs before and after the gig!